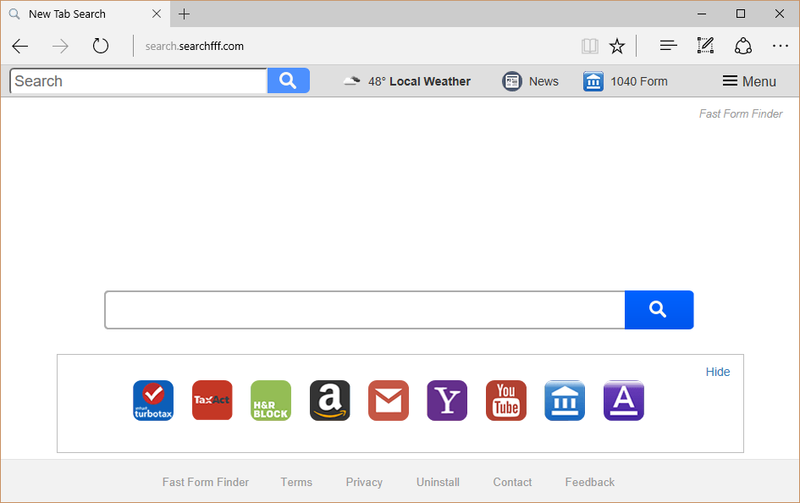 Searchfff.com is a browser hijacker that may have entered your computer together with free software. Users who have not encountered a hijacker before might become alarmed when they notice that their browser’s settings have been changed but there is no need to be too worried as hijackers are not malicious. They generally aim to generate traffic for sponsored pages because that is how they make income. You will be redirected to all kinds of weird pages for this reason. And while the hijacker itself is not malicious, the web pages you will be redirected to may be. You could be led to a page where malware is lurking and end up with a serious virus infection. If you care about protecting your computer, we suggest you remove Searchfff.com as soon as possible. All browser hijackers use the same method to spread and that is via free software. They are attached as additional items and are set to install alongside. If you want to stop them, you have to manually deselect them. You can do so in Advanced or Custom settings during freeware installation. Just uncheck the boxes of those added items and you can safely install the freeware. Do not rush through the installation process in Default because that is exactly why you are stuck having to delete Searchfff.com. Those settings will not show you what has been added so everything will install. Searchfff.com will take over all your browsers, including Internet Explorer, Google Chrome and Mozilla Firefox, and change settings. Every time you open your browser, you will be taken to Searchfff.com because it has been set as your homepage and new tabs. Until you remove Searchfff.com, you will no be able to change the settings back to what they were. You will be presented with a search engine that looks exactly like countless other hijackers. We do not suggest engaging with it because you will be shown sponsored results. At first, you might think that the results were generated by Yahoo but at close look, you will notice that it says Saferbrowser Yahoo Search. This means that you will encounter sponsored sites. Redirecting you to those sites is how the hijacker manages to make income. These redirects are surely annoying but they can also be dangerous. You could be taken to malicious pages and end up with a serious malware infection on your hands. Hijackers do not filter through the pages to make sure they are safe so the infection is highly probable. The sooner you delete Searchfff.com, the sooner you can go back to normal browsing. We suggest users obtain professional removal software so that you can be sure that you erase Searchfff.com fully. The program would locate and uninstall Searchfff.com without you having to do anything. You can also chose manual Searchfff.com removal and you can find instructions to help you below this article.